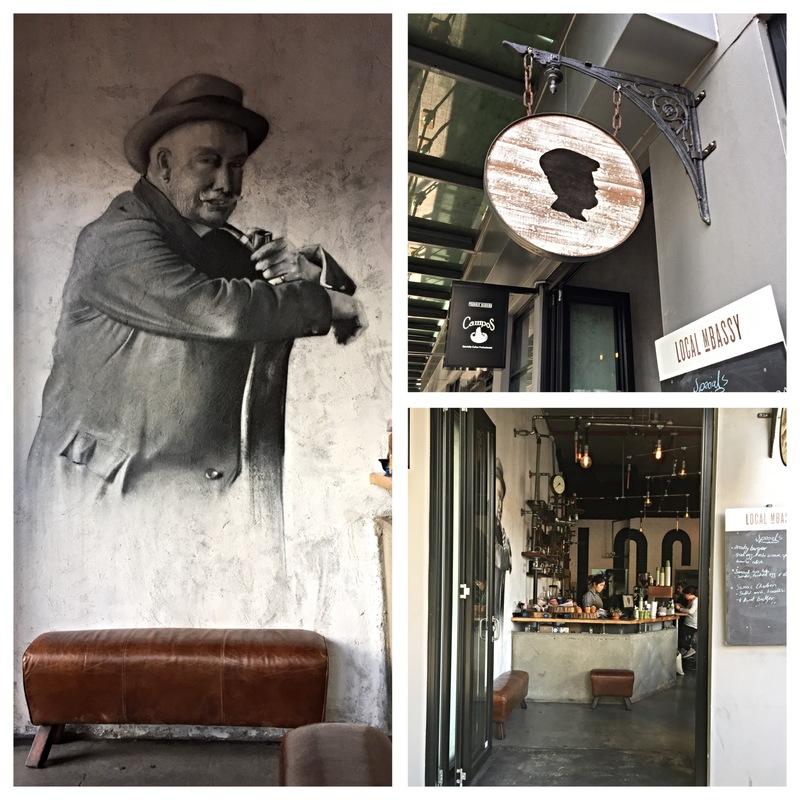 Ultimo, once known to be a very industrial and rundown suburb on the outskirts of the Sydney CBD, has undergone significant gentrification in recent years. A walk along Wattle Street from George Street towards the Fish Markets may surprise most long time Sydney siders, as they see the picturesque parks, towering greenery and beautiful terrace houses line the street. In the midst of this, you could say it was inevitable that a cafe serving fine breakfast food and excellent Campos coffee open up right on Wattle Street. The Local Mbassy opened up a couple of months ago and has taken the Sydney food scene by storm – because of one dish – the red velvet pancakes. The space itself had a great feel, with rustic murals and antique fittings lining giving the interior a really unique feel. Scrambled eggs with a side of avocado and paprika ($12): Gordon Ramsay once said that the true test of a chef is how (s)he can scramble eggs. Judging by the scrambled eggs along, the chef here is excellent – the eggs were moist and cooked perfectly. While very simple, the scrambled eggs coupled with a side of avo and paprika made for a really delightful breakfast! Poached eggs with a side of mushrooms ($12): again, eggs very well cooked and the mushrooms were just delicious. So good that we ordered another serving to share. Cracked pepper steak – 300g grass-fed scotch fillet, watercress seeded mustard salad, hand cut chips, cracked pepper jue ($23): if that introduction wasn’t enough, then you will definitely be satisfied with the taste of this dish. My friend across the table was quiet as he had the first few bites – the silence said it all! 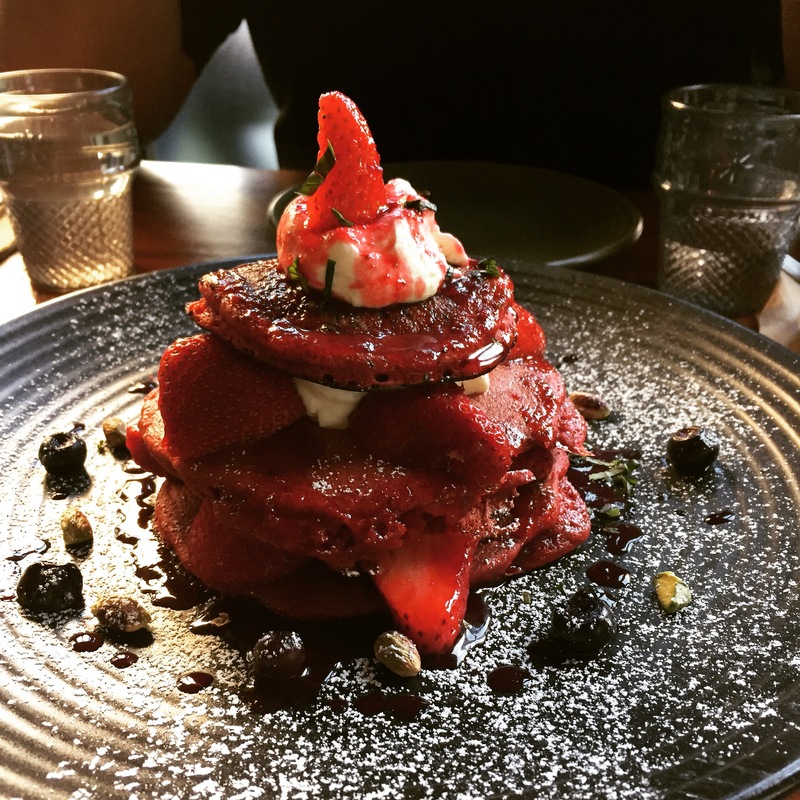 Red velvet pancakes – served with strawberries and cream ($15.50): visually there is no question this dish is a stunner. To be honest, I ordered it for the novelty factor, expecting a sickly sweet and heavy dessert. I was actually pleasantly surprised when I tasted it – how light and fluffy both the pancakes and cream were. Shared between three people, the pancakes were the perfect finish to our perfect breakfast. 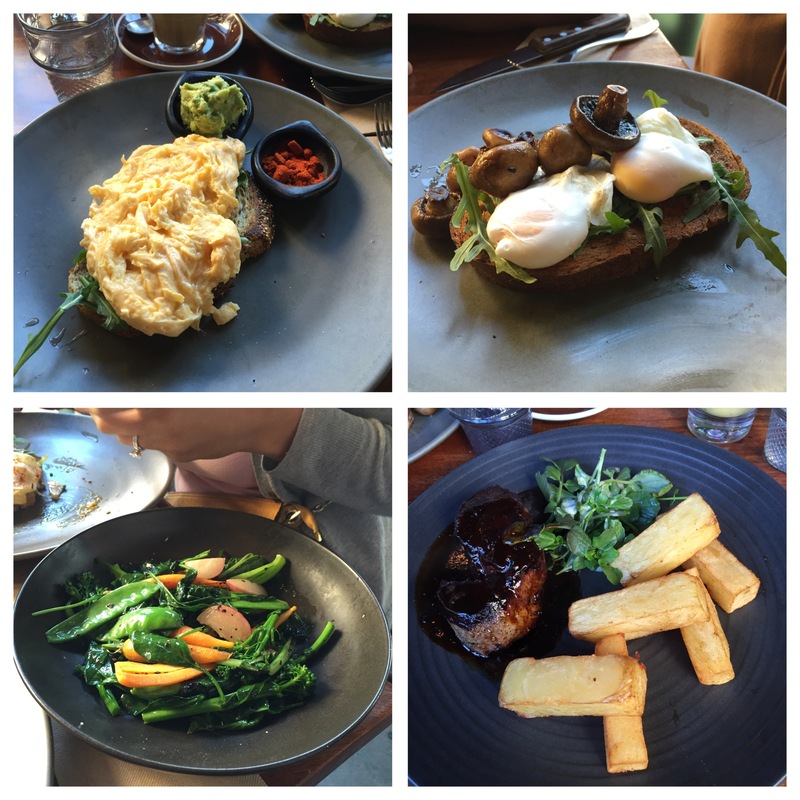 This entry was posted in Brunch, Cafe and tagged Breakfast, Brunch, campos, red velvet pancakes, ultimo. Bookmark the permalink. mmm those scrambled eggs look super fluffy! Yep so so good! 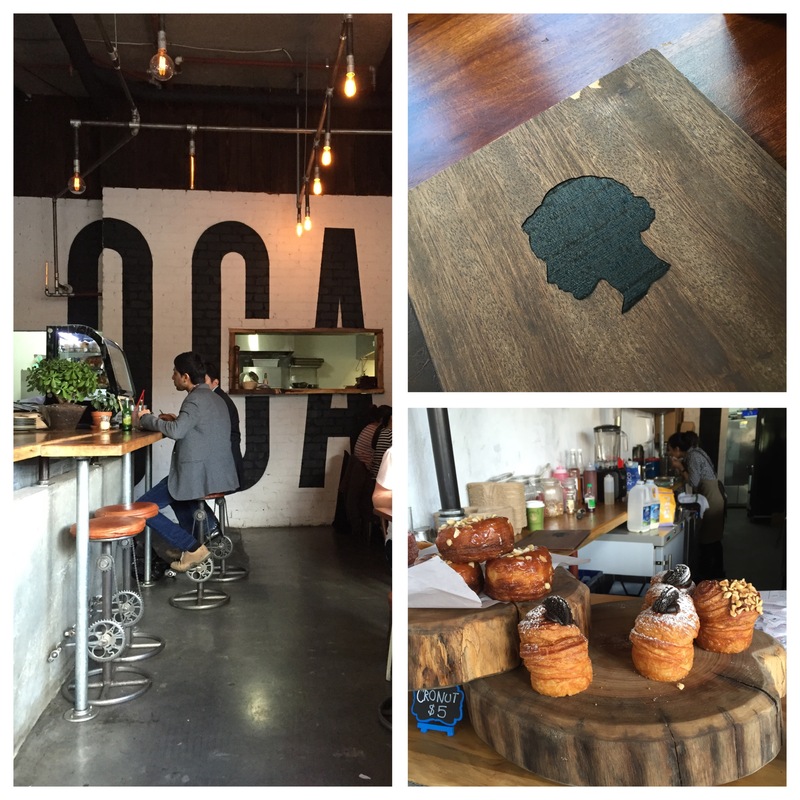 Have you been here yet?